St. Louis’ sewer district institutes UV disinfection projects. The Metropolitan St. Louis Sewer District (MSD) headquartered in St. Louis, recently completed one of the largest ultraviolet (UV) wastewater disinfection projects in the country at its Lemay Wastewater Treatment Plant. The MSD covers 525 square miles and encompasses all of the city and approximately 80 percent of St. Louis County. MSD serves a population of approximately 1.3 million and operates seven wastewater treatment facilities, treating a combined average of 370 million gallons of wastewater per day. The project included construction of a cutting-edge UV wastewater disinfection system with a treatment capacity of 240 million gallons of effluent per day, utilizing 3,600 individual UV bulbs. UV irradiation systems disinfect by inactivating pathogenic microorganisms, such as viruses, bacteria and parasites. Wavelengths of light inactivate micro-organisms by damaging the nucleic acids (DNA and RNA), thus disrupting the organisms’ ability to replicate. No chemicals are added to the water being treated, and no disinfection by-products are formed. Construction layout and dimensioning of the UV disinfection system’s channels were critical components of the project. 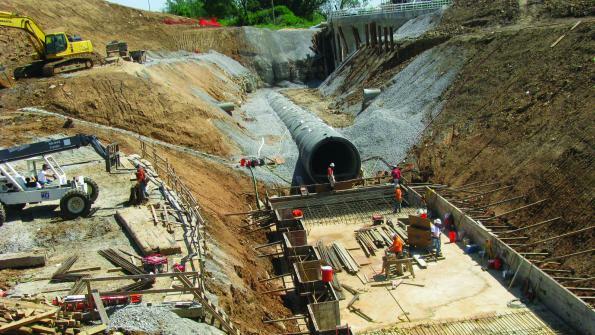 Requiring approximately 6,500 cubic yards of concrete, an estimated 10,400 wire terminations to connect the UV power and controls, and 560 tons of reinforcement, the system’s UV channel widths had to be constructed to an accuracy of +1/2 inches minus 0 inches. The project also required installation of two, 144-inch pre-stressed concrete cylinder pipe connections to existing structures. The existing bulkhead gates in both structures leaked excessively, preventing the removal of the bulkhead pipe caps intended to allow future expansion. The leaks could not be fixed through conventional methods. Divers were brought in to seal the leaks from the inside at one of the structures. The other structure required a more extreme approach. Using experience gained from a previous project, the team coordinated an effort to retain wastewater in the collection system and the plant for later treatment. This allowed crews to get inside the structure and work on it dry. Additional wastewater storage was also required to complete modifications of a weir wall within the existing plant piping system. A final flow stoppage and storage for the entire plant was required to complete upgrades to the existing incoming plant electrical switch gear. This work required additional coordination with the electric utility to shut down both utility power feeds to the plant substation. KAI Resident Project Representative Dave Tesson says the project is an example of the achievable successes of teamwork.